"My mom and I both use. This cream is a miracle worker. Thank you so much. We both live with so much pain. " Great for diabetic neuropathy and arthritis pain. 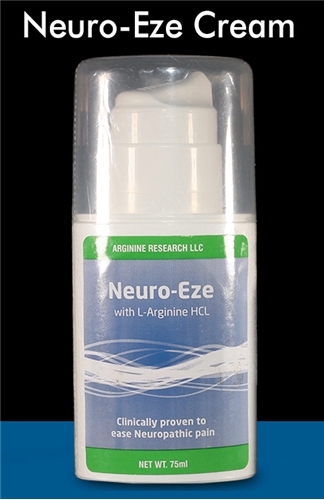 Neuro-Eze is a specially formulated cream that delivers the essential amino acid L-Arginine through the skin, transdermally. Neuro-Eze cream increases oxygen content in cells, temperature of extremities, and helps circulation. Easy to use, measured-dosage pump bottle. Directions: Apply one measured pump 2 to 3 times daily as needed for pain. Simply rub cream into the skin for 2 to 3 minutes. Best results are achieved when used both morning and evening every day.